I know I said that today would come a goal review, but in the midst of finishing papers and moving to a new apartment, I honestly did not have time for such a task - perhaps an indication that a review is in good order. Nevertheless, as I was cleaning my last apartment and getting ready for the final walk through, I had a few thoughts about my former home. There was some kind of emotional attachment to that old, rickety building. It's not that I didn't mind the scent of marijuana pervading the air, or the toilet so bashful to flush it would never relinquish any of its crap to the septic tank without a "gentle" coaxing from our plunger twice a day. We got over the fact that the plastic wall of our shower was installed upside down, leaving the shelves with a nice, downward-sloping 45-degree angle. Nevermind that our heating had two settings, Seventh-Circle-of-Hell and Off, and our localized A/C was rarely able to cool anything beyond a small 5-foot perimeter in the corner of our kitchen. And we got used to the fact that the people below us were chronic chain smokers who must have enjoyed making us feel like we were living in Joan Rivers' left lung. Occasionally even a bit of poop water would splash on our clothing for the second or third time in a week, and we'd naturally grow weary of living there. But there were still memories from our 7-month stay. Good ones, actually. The place had character, windows in every room, the feel of downtown. Not just the "there's-another-drunken-fight-in-the-parking-lot-at-3-am-because-some-guy's-baby-momma-won't-let-him-stay-out-with-his-friends-to-get-trashed" feel. There honestly, is a sort of sense of community there. When you pass the barista you know from the local coffee shop or that guy who just bought a mo-ped because gas is so expensive or that server who always brings you your drinks at the local lounge, you feel like you belong to something bigger. You are a part of thriving culture that relies on its relational connections to survive, not on the main-stream media that are hit radio stations and MTV. It's a culture that values the artistic expression of ideas. I will miss that character, and I hope to stay connected to that downtown culture. Maybe someday I will move back there to reconnect with character. Even if it's at the expense of convenience. There's always some sort of period of readjustment that takes place when you come back from a vacation. In one sense, you've lost momentum that you have to make up for. In another sense though, you could have used the time to revitalize somewhat. I hope this week I can get back on track with some momentum. As far as blogging, I think I'll do a few "update" things this week. I'm definitely in need of a goal review, which will come out on Wednesday. And I think Friday, I might present some of my findings from a big research project I've been working on the past few months. Besides blogging, however, this week is a little scattered. I don't have classes that are meeting, so there is little in my schedule that is fixed around which I usually structure my day. That's not to say there isn't plenty to do. I have to finish my research project, which really just entails editing and forming a presentation from the paper. And I have to move into a new apartment today and tomorrow. Anyone wanting to view some photos from my trip to Chile can look at my two Facebook albums. They should be configured so that anyone (with or without a Facebook account) can view the albums. The first album covers my visits to Santiago, Valparaiso, and Viña del Mar. The second album finishes up Viña and continues on through Puerto Varas and finally to Chiloe. Well, I'm back from Chile today. The whole experience was absolutely amazing. Nature is somehow much more untouched and pristine there. Life teems everywhere. Plants grow out of plants which grow out of the bark of trees. Everyday evidence of what makes its home in the ocean comes in on the small fishing ships. And nothing is wasted. The heads and feet of pigs are readied and sold in the display cases at the local super grocery conglomerates. They are used to make soups. The intestines are typically dried and sold by street vendors. The huge sea plants that wash ashore are similarly dried and eaten as snacks, their saltiness coming directly from the sea water they grow in. The people and their way of life is also quite remarkable. Rising every few hours to put more wood in the stove that heats the house. Gathering in large groups at dinner tables with all kinds of food and fellowship. The people are extremely generous and kind. No one pours their own wine without first refilling everyone else's at the table. All these things really made me love the place. Still, for all that love, I really did miss home. Now let me rest a bit, and I will post more soon. A few days ago I visited Valparaiso and Viña del Mar, two coastal cities about an hour and a half from Santiago. These cities were incredibly gorgeous and perfectly complimentary. Valpo (Valparaiso's more common nickname) is the old city. Art and culture are plastered on the winding walls that twist and turn up the mountains, creating a great maze of streets and developments, all built one on top of the other, and all looking out over the Pacific Ocean. 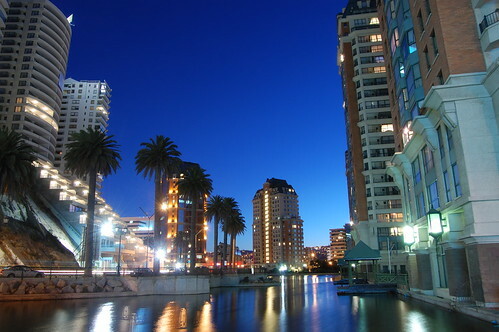 The city is fairly large for Chile, but has a very quaint feeling to it. As in all the cities, dogs roam the streets, and friendly people bid you to come into their "rincones" to see what they have to sell. We had children run up to us and plainly ask "¿De qué pais son?" - "What country are you from?" We'd respond, "De los estados unidos, ¿y tú? ", and they'd giggle and say "¡De Chile, claro!" before running away. Viña is a different city. Separated by only a few kilometers and a 90-cent subway ride, you wouldn't expect such a contrast. Casinos and modern hotels line the beaches; English is displayed on the signs of the local Blockbuster and McDonald's. The dogs are still there, though fewer of them (we are told that when several dignitaries, including President Bush, visited awhile back, the government rounded them up and sent them to be put to sleep), but the streets are always clean. The beach is gorgeous but is not for swimming. Some of the largest waves in the world crash against the jagged rocks that lie on either side of most of the public beaches, creating a deep bass the shakes the ground and resonates in your chest. It isn't the charming Valpo, but it is definitely beautiful how these two cities come together, making up for what the other lacks. If I've learned one thing on my trip to Chile so far, it's that the unexpected always happens, and you can either let it affect you in a good way or a bad way. I think I've found that if you embrace it, whatever it is, you can find the good in it and enjoy life for exciting and unexpected things that happen. We arrived in Osorno this morning on a 10-hour, over-night bus ride from Santiago. Lost and freezing, we wandered the streets at 8 o'clock this morning. There were a few things we needed to accomplish and soon. First, we needed to find a place to stay. It needed to be cheap, and we had to be able to leave our stuff there for awhile. Second, we needed to figure out how to get to Antillanca, the volcano we would be using for snowboarding. And third, we needed to get some food in our stomachs. I had been throwing up for the past few days and eating little, so now that I was feeling better, I needed to get some nutrition to make up for what I lost and energy for the snowboarding to come. Thankfully, we found a place to stay fairly quickly. The nice old babushka let us leave our stuff there and even use her personal room to change into snowboarding gear. We paid her 14,000 pesos for a double and promised to return that evening after snowboarding. Next, we searched for a bus to take us to Antillanca. The best we could find was a bus that would take us as far as Aguas Calientes, the hot springs near the volcano. From there, we were told we could catch another bus to the base of the volcano. We rode for about an hour and half, drifting in and out of consciousness. I'd wake up one moment to see the bus packed full, people crowding the aisles, drifting off again, and waking up to mostly empty seats. We cut around mountains, peered down into valleys full of water, and across the lakes to see waterfalls crashing across the rocks in the distance, falling what seemed like hundreds and hundreds of feet. We finally arrived, exited the bus, and asked around about how to make it up to the base of the volcano. Everyone was confused by our question. Finally, someone explained that buses don't go to Antillanca. You have to have your own car or hitchhike with someone. We wandered the national park near Aguas Calientes, literally just a few miles from Argentina, thinking of what we could possibly do. With no cars passing through the area, however, we had to lay our hopes of snowboarding to rest for the day. What we found instead though, was a great meal at the restaurant near the hot springs, a beautiful hike through the forest, and a much-needed siesta back at the hostel when we returned. We embraced the unexpected, looked to the positive, and now refuse to imagine it happening any other way. The unexpected in life is exciting and beautiful. Cell-phone-less I enter the airport and check my bag. The stress lately has me worried about almost everything, and even now I can't help but think, what if this bag never makes it to Santiago? But I'm letting go. In a sense, I'm forced to think about it. As the plane cuts through the clouds, and the landscape below unfolds in patterns, we are all letting go of the earth for a brief moment. Making our way amongst and in-between the towered, cottoned plumes, held suspended in the sky, I catch glimpses of detail in them when light hits a darkened crevice and scatters. The wine is wearing off for now. It was about 2 hours ago that I finished a glass of the '97 vintage red blend from California. We came across it while hunting for a California Cabernet to gift my host family. I think it's a nice gift. Who doesn't like wine? It's luscious and rich. It's not immediately gratifying, but with patience its complexities are understood, appreciated, and supremely admired. Once opened it begins transforming itself - into so many things - flavors of herbs, spices, fruits or nuts. But perhaps its greatest trait is that it can transform the most adamantly stressed into a near-sighted epicurean. Perhaps on this trip, a little wine will serve to remind me that all of this is about letting go. Well, it wouldn't be a theme week without a video from TED.com to cap it off. This one features the prominent author Amy Tan. She talks about her childhood and creativity, but some of the most insightful parts of her lecture come when she shares from her travels to the East. I read recently that one of the writers for Lonely Planet faked the book about Colombia. He said he didn't have the money to travel there, so he used his girlfriend who was from Colombia to write most of the content of the book. Lately, I've been doing my travel research on blogs, and I've been finding that these are veritable goldmines of first-hand information. Many of these travel sites are focused on one thing: the bottom line. They are willing to send the cliché America tourist to the cliché tourist spots, where the prices are all jacked up, while the rest of world lies in relative obscurity, undiscovered by the typical traveler. Many personal blogs, however, are devoted to their authors' personal discoveries while traveling. I have been finding many of these personal travel blogs to be extremely interesting and helpful, as well. This last one is really interesting in that it lists traveler's trips with journal entries and photography. One of the coolest ones features 80-some stops as the travelers hugged the entire coast of South America. "If you make it a priority. . ."
I was a jazz pianist at local fine dining restaurant about 5 years ago when a wealthy couple slipped me a business card and asked me to sit with them while I took my break. They introduced themselves as the Wecksteins. The man was the president of J.Q. Hammons Companies, and his wife had her own business. They apparently liked my music and had previously sat near me at the bar while I was on my breaks. Over the next few months they would show up to the restaurant and ask me to sit with them. I heard stories of their travels around the world. A little younger and a little more shameless, I would ask questions like "What's the most you ever spent on a dinner tab? ", and I think they, having worked hard to earn their wealth and power, kind of enjoyed answering the question: "$1000 for two at restaurant on the water in Hong Kong." I would literally sit there, enthralled at the stories of their experiences. Finally, one night as they wrapped up their meal and I was to return to playing, I said, "I hope one day I'll be as privileged to travel the world like you do." And the lady discerning the subtle defeatism in my attitude leaned in and grabbed my attention with her eyes. "You can do anything you want," she said, "if you make it a priority. It doesn't matter how much money you have. It'll always have somewhere else to go if you don't set it aside for the things you want. There are rich people who can't spend the money to get to Hong Kong because they won't. But you will go there if you make it a priority." Chances are, if you are reading this blog, I know you, and you are already acquainted with the concept of mini-retirements. The recent popularity of author Tim Ferris' book The 4-Hour Workweek has brought the idea of mini-retirements to the masses. In his blog, he actually continues to write quite frequently on the topic as well. The idea behind the mini-retirement is that the typical plan of working hard through 40-some-odd years to only then be followed by a relatively long vacation seems little backwards. First, to save your retirement for a time when the rest is generally accompanied by a certain amount of restlessness, sending you right back to work of some kind, or when you are too old to enjoy many of the things you would have liked to do when you were younger, all seems a waste. Ferris' idea is that we should take mini-retirements throughout our lives, where over the course of a few months or even years, we change the scenery, even the work, and recharge our batteries for new eras in life. Some other interesting perks to the mini-retirement concept include that many times it ends up being cheaper to rent an apartment and buy food for a few months in another country than if you were to retain a residence in the your own country. Ferris includes blog posts that talk about getting much of this travel for free by simply volunteering for humanitarian organizations. The experiences alone can give you great new ideas and expanded knowledge leading to new goals and all this in addition to the character growth from volunteering. Consider this guy's post on the topic. I also decided on this topic as it makes for a nice introduction to this week's theme: Travel. I suppose I'll do another bonus post this Saturday. Again, this video comes from TED.com and is one of the most interesting and exciting talks I've heard on the site. So in keeping with the environmentalist theme, here is William McDonough surmising on what it will take to create a greener future. Pixar's new movie Wall-E is funny, cute, and entertaining, but the undercurrent of social commentary is anything but subtle. Growing ecological concerns have made this a prime time for the release of such of movie. And movie-goers have likely seen the theme elsewhere, as A.O. Scott points out in his New York Times review of the movie. As the earth heats up, the vanishing of humanity has become something of a hot topic, a preoccupation shared by directors like Steven Spielberg (“A.I.”), Francis Lawrence (“I Am Legend”), M. Night Shyamalan (“The Happening”) and Werner Herzog. In his recent documentary “Encounters at the End of the World” Mr. Herzog muses that “the human presence on this planet is not really sustainable,” a sentiment that is voiced, almost verbatim, in the second half of “Wall-E.” When the whimsical techies at Pixar and a moody German auteur are sending out the same message, it may be time to pay attention. The idea of consumption is actually made to be so ridiculous that it might at times seem difficult to see ourselves in that mirror. There are instances when evidence of the past consumerist societies and their incredibly large shopping centers flash across the scene. The apparent all-encompassing retailer of the time also has its own website to go along with the plot. And though its funny to watch and think of the ludicrous myopia of this fictional society, one can't help but see the similarities to our own consumerism. It kind of begs the question: how fictional is this depicted society? And will we take note of its subtle lessons? I just finished reading this book by Jared Diamond. The book goes into such depths to make its point (which wasn't even clear to me until near the end) that I'm not sure I'll be able to hash out even a satisfactory overview here. I'll see what I can do, though. Diamond takes us on a journey through past failed civilizations, explaining the circumstances surrounding their collapses. Approaching this book, I was expecting there to be some kind of correlation between cultural traditions and the onset of collapse. I had, after all, heard stories that Rome's fall was preceded by and due in large part to a moral degradation of society. What I found instead was initially uninteresting, so I put down the book. For about 8 months (my disinterest, a symptom of my selfish ignorance). I was going through my audiobooks this summer, trying to rationalize purchasing another, when I came across this yet unfinished book. So I promised I'd finish it before I allowed myself to buy another one. As the book details (and I mean details) the societal climate of these past civilizations, one quickly finds that they all have something in common. It's not the degradation of morals that unprops a society into utter collapse but the degredation of their respective ecosystems. The effects of deforestation, chemical contamination from mining, depletion of our ocean's seafood from overfishing, and irresponsible farming techniques all contributed to these society's downfalls. Diamond ultimately lists eight factors that were a part of past failed societies and four more factors that might contribute to the weakening and collapse of present and future societies. I can unfortunately do for you little more than recommend the book or point you towards one of Diamond's articles in the New York Times. I can give this thought, however: Next time you find yourself in your local bookstore, pick up a copy and read the closing chapter. These growing concerns must be addressed. All one has to do is a simple thought experiment, considering what our society would be like with drastic food and energy shortages, to foresee the impact of a degrading ecosystem. These types of shortages contribute to the war-like conflicts we see throughout parts of Africa and the Middle East, not to mention China, India, and even Japan earlier in the last century (though they addressed their problems as is discussed in the book). If nothing else, keeping in mind these factors and how our actions either create or support chain-like series of events that lead to them, we could probably do a lot of good just by making some small changes in our habits. In our society our mindset needs to change from the selfish ideals of consumption to that of stewardship and respect for our environment. We must focus on these factors now because even today evidence slowly mounts for a future collapse.